This is one of my last-minute all-in-one meal recipes: something quick and easy, but still a well balanced meal. Because it’s so easy to cook, I’m a bit embarrassed to call this a “meal”. I like to eat it with soy sauce. When you have some left-over tofu, try to make this. I used this sumo plate for the recipe photos this time. This is already more than 30 years old. It was a gift to the people who went to watch a sumo competition and seated the “mass seki” which is a close to the sumo stage, and is a square sitting space for a group. To be honest, I can’t say it’s my favourite, but it reminds me of family meals at home. But never imagined I would bring it to Switzerland! Cut the tomatoes in half. Roughly break the tofu by hand. Mix the egg with salt in a bowl. Heat a frying pan with medium heat, and add cooking oil. Add the tofu and tomato, then cook a few minutes covered with a lid. 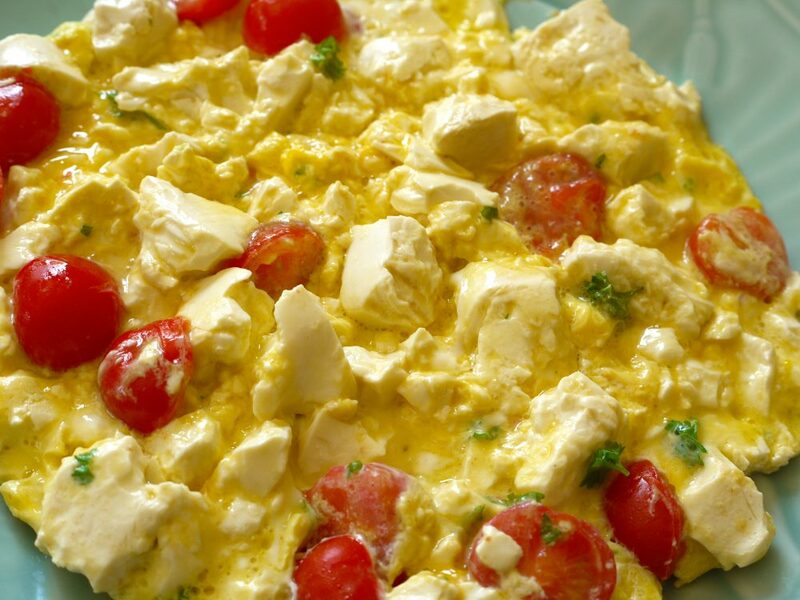 Pour the egg mix over the tofu and tomatoes. Put the lid on again, and cook until the egg sets. Serve with soy sauce to your preference.